On May 6-7, the Academic Senate for California Community Colleges hosted their first Student Senate General Assembly. Taken place at the Hyatt Islandia in San Diego, four of Skyline’s student government officials attended the statewide student congregation to discuss the upcoming stages for the new Student Senate Governance. Due to a timely family event, Skyline’s student body president Taylor Angel was unable to attend. In turn, student government officials Peter Monrroy, Jonathan Vasquez, Victoria Sorkina, and Charles Lee represented Skyline’s presence and position on Model E, the new Constitution, and Skyline’s Regional Representatives. 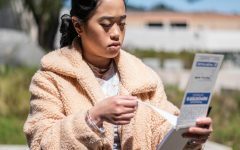 According to the Student Senate for California Community Colleges (SSCCC), the Student Senate was created in correlation with local associated student organizations in order to allow community college students to have participation regarding state policies. Developed by the Regional Representatives of the SSCCC, Model E was another topic discussed in the assembly’s agenda. The model was created to give local community colleges representation at a state level, allowing local college leaders to voice opinion through a systematic ladder. Issues needed to be addressed would be brought to the attention of regional representation by local campus leaders. The issues would then be presented to the state by the Regional Representatives. Despite the fact that Model E is already implemented on the community college school system, the assembly’s two-day agenda included a discussion of Model E’s pros and cons. Regardless, Model E still stands, along with our newly elected Regional Representatives. Of five nominees, Rose Nemet and Melvin Douglas Haywood were chosen to represent Skyline at a state conference. Due to the assembly, each of the 10 divided regions of California have been given a set of two representatives, and the Student Senate Constitution is now ratified.